We had heaps of fun in class this week, and did science too! First we go to complete our investigation. We went over our planner first to make sure we understood what it was were investigating. We took turns, 3 people at a time to drop our helicopters in a very controlled way - no wind, same drop height, same weight and only changed the length of the wings. In every students test, we got the same results - the helicopter with the short wings hit the ground first, while the long wing helicopter fell down slower. Afterwards we discussed and communicated what push and pull forces were acting on the helicopter as it fell. The same amount of gravity was pulling on each of the helicopters, but the longer wings had more surface area to catch the push of air as it fell. The long wings had more air resistance and the short wings had less. The air resistance (upward push of air) slowed down the fall. 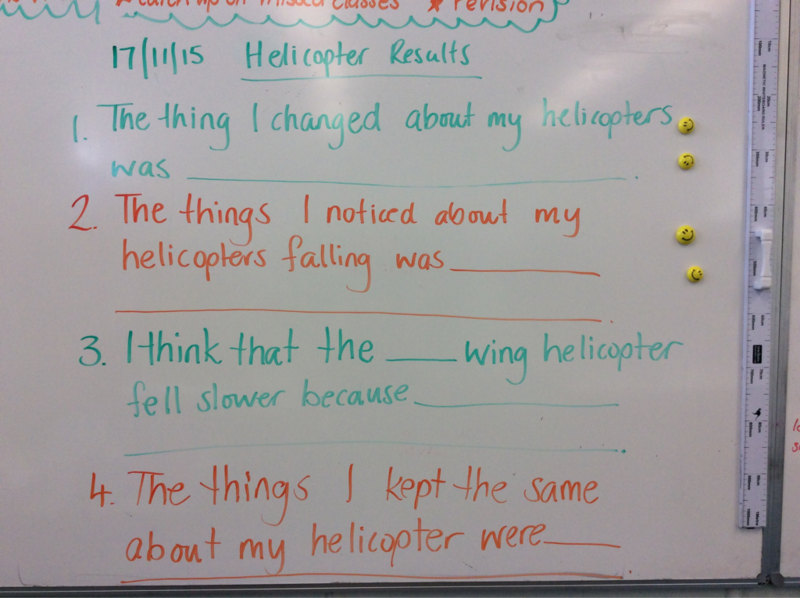 Afterwards we completed some science sentence starters to show how we made the test fair and explain our results.